Relive the classic Walt Disney movie Snow White and the Seven Dwarfs and bring home this unique Thomas Kinkade collectible! Thomas Kinkade, the Painter of Light, emphasized simple pleasures and inspirational messages through his art. 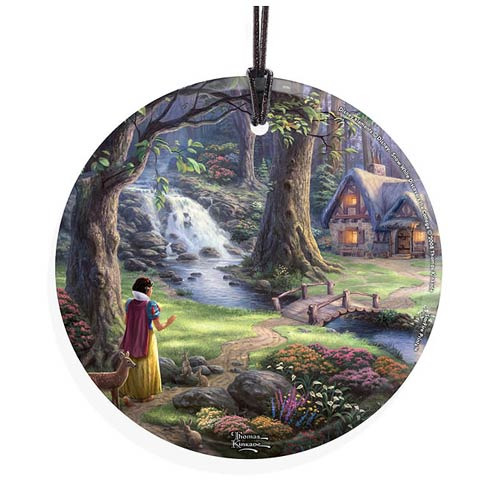 The Snow White and the Seven Dwarfs Cottage Glass Print shows a charming image of Snow White looking out at the dwarf's cottage. Complete with a hanging string, this Snow White and the Seven Dwarfs Snow White Discovers the Cottage by Thomas Kinkade StarFire Prints Hanging Glass Print comes ready to display! Measures 3 1/2-inches in diameter. Bring home this Disney Princess today!